Traditional Carpets is an approved Amtico Flooring Specialist and Showroom, for expert guidance and fitting. Samples are available either from the showroom or at the time of a site visit. Amtico floor tiles are made from resin compounded with high quality plasticizers and stabilizers, all compressed under pressure and temperature. Many tiles closely resemble natural products, these are made from specially printed films sandwiched between a wear layer and a backing. 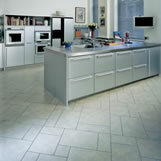 This produces a flooring that is very durable and thin. Some tiles are engineered to have a specific emboss or a metallic appearance. Amtico flooring has an unrivalled reputation for performance, durability and ease of maintenance that gives you the feeling of confidence coupled with luxury. And it looks so real. It is perfect in most domestic and commercial environments: from the lounge, bathroom and kitchen, to offices, shops and leisure facilities. There are nearly 200 designs to choose from, with finishes ranging from wood, stone and slate through to glass, metal and ceramic, as well as borders and motif options. They all create the very special feeling that an Amtico floor can give, in all domestic settings. Click on the thumbnail room views below and on the right for larger images. Amtico options, products and room settings can be viewed in much greater detail via the Amtico link on the right.